It won't be long now. In March of 2010 a group of Serbs announced that this spring they’re going to start digging on Ada Ciganlija for the Mihailovich remains. Ada Ciganlija, a sort of “river island peninsula” between the Sava River and Belgrade, used to be the notorious place where executions of “undesirable elements” were carried out. Now, “Ada” is one of the most popular recreational spots in Serbia, where hundreds of thousands of locals and visitors go to enjoy nature, beaches, and sports activities. You’d never know it was once a killing field. 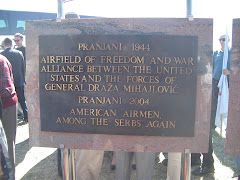 It’s here, on the grounds of this fun place, that the remains of General Draza Mihailovich, the slain Supreme Commander of the Yugoslav Army of the Homeland in World War II, are thought to be hidden. That’s where the digging will begin now that the spring has come. If they don't find what they're looking for there, they'll move on to somewhere else. On July 17th, 1946, after a phony trial that would have made the O.J. 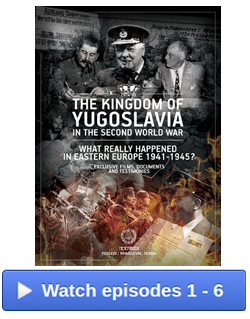 Simpson trial look like a paragon of judicial virtue, the Yugoslav communists loyal to Josip Broz carried out the execution that Tito had mandated. 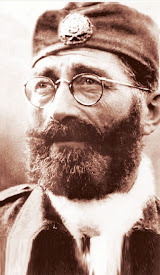 Tito was finally rid of his nemesis, Mihailovich, the Chetnik freedom fighter and true democrat, who had remained loyal and true to the Western Allies despite their abandonment and betrayal of him, and who had earned the respect, the trust, and the love of the people. 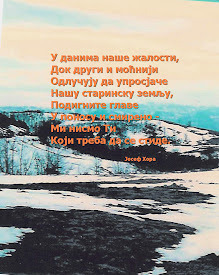 Josip Broz was a shrewd man. Tito knew that by executing Draza Mihailovich, he would instantly elevate Mihailovich to martyrdom, but at least by hiding the remains he would guarantee no gravesite for the fallen General. Thus, there would be no shrine. There was to be no funeral. There was to be no "official" burial. There was to be no gravesite. And, most importantly, there would be no shrine. Nobody was even to know exactly where the remains were disposed of except for whoever was taking care of the disposal. Maybe he figured “out of sight, out of mind”. 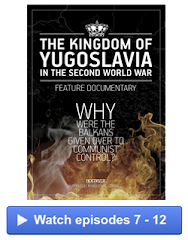 But, even shrewd men like Josip Broz, who from the very beginning of his rise to power in Yugoslavia had set about establishing a cult of personality that would have made even Hitler, Stalin and Churchill jealous, have their limitations. 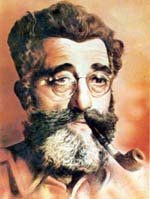 He didn't count on the chord that General Draza Mihailovich struck in people being so transcendent, transcending time and place to where people who weren't even born until long after World War Two, a million miles away from where it had been fought, would be struck by the Mihailovich legacy and captivated by the virtues inherent in it. He also didn't count on DNA and technologically advanced tracking and seeking equipment that can locate and identify things hidden way beneath the earth's surface. Like bones and teeth and things. So, even Tito, who thought he had everything wrapped up in July of 1946, couldn't quite "finish the job" so that it was completely finished. The dead have a way of talking when their lives have been taken under unethical and immoral circumstances. For a very long time, years and years, I've been harping about that non-existent gravesite and what a travesty that is. How can a man like General Mihailovich not have a gravesite? On my first trip to Serbia in the winter of 1995, the phantom of no gravesite haunted me. 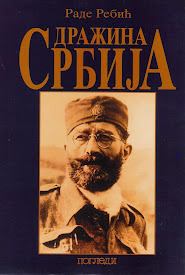 But then it dawned on me that Draza's spirit was EVERYWHERE in Serbia. It was too big to be contained in one little spot. That epiphany made me feel much better. Sort of. 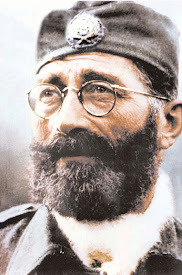 Unlike his rival, Yugoslav communist leader Marshal Josip Broz Tito, General Draza Mihailovic was, and remained, a true man of the people in his beloved Serbia. 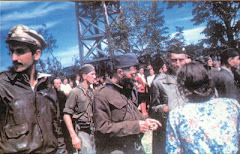 Even as he rose to fame for being the first real, and successful, resistance leader in occupied Europe during World War Two, General Mihailovich remained a humble man whom the people adored. He did not lie to them, he did not seek to rule over them, and the sacrifices they willingly made on behalf of the Allied cause would tear at his heart. The people remained loyal to General Mihailovich, just as he remained loyal to the Allies, to the very end. There is something very wrong with there being a “House of Flowers” complete with lovely landscaping in Dedinje, one of the wealthy neighborhoods in Belgrade, with a bronze likeness of the dictator Tito watching over his white marble mausoleum hung with red velvet curtains, housing his massive marble, gold inscribed tomb, and there is not even a headstone, not even a marker, for the beloved General Draza, in all of Serbia. It is not even known where General Mihailovich is buried. Serbia must rectify this. She owes General Draza Mihailovich that. She owes that to the people that loved him and their descendants who know only the legend but who carry on the legacy. He was a man of the people in the truest sense of the word - a hands on leader who was “in the trenches” with his men, who never took his people for granted, who chose to stay and meet his fate instead of leaving when evacuation was offered to him, and who paid for his love of his country with his life. 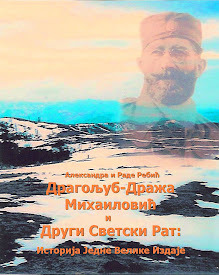 One year ago, in March of 2009, the Serbian National Defense Council of America announced that a reward would be given to anyone who could locate the remains of Mihailovich, after those remains were proven to be his. Although I can’t speak to previous such offers and challenges or if such were made, I know that this particular challenge was heard around the world and set off a flurry of activity and interest. I told SND President Slavko Panovich shortly after the offer went public that I was convinced that his initiative was going to have a good result and that without it the search for the Mihailovich remains might have remained forever dormant. Others have also issued the call to find those remains, among them Aleksandar Cotric and his group in Serbia, whose motivations and intentions, I believe, are pure. Then, in a conversation in June of 2009, Mr. Panovich said something about the matter that really struck me. It was something along the lines of “the entire Serbian nation being buried along with Mihailovich”. 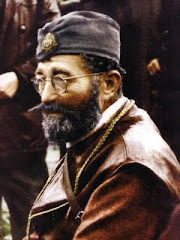 In other words, with his death, something essential in the heart of the Serbian nation died as well. Perhaps with finding the remains of Mihailovich and attending to them properly, the Serbian nation, and with it her national spirit, can find itself again. I'm confident that 2010 will be the year that the remains of General Mihailovich will finally be found. The searchers will find something. And they'll get a DNA match. But, that’s when things will get tricky. The old adage - "Be careful what you wish for" may come around to haunt all of us who have wished for the same thing all these years. Where are the Mihailovich remains going to be stored so that they remain safe until the time comes for the burial? Where is the memorial service going to be held? What will it consist of? Where is General Mihailovich going to be buried? Who is going to conduct the funeral? Who will be allowed to attend the funeral? Is the funeral or memorial service going to be public or private? Who's going to be ‘invited’ to attend the service? What is the Mihailovich gravesite going to consist of? What kind of headstone and what will it say? Those are the immediate questions that come to mind as I consider the prospect of the Mihailovich remains being found so that he can be laid to rest in the manner in which he deserves. Since it will be the Serbs who will be making those decisions, and anyone who knows the Serbians understands that being able and willing to come to a consensus is not one of their primary character traits, things could get very lively indeed. Perhaps poor General Mihailovich will end up wishing they'd just left good enough alone and had let him be, wherever that’s been all these years. I wonder if the powers that be in Serbia have even begun to consider these questions and all the collateral and unintended issues that will inevitably arise. I sure hope so. The President of Serbia must be at that funeral service - Serbia owes. The Prime Minister of Great Britain must be at that funeral service - because Great Britain owes. The President of the United States of America must be at that funeral service - America owes. And General Mihailovich, if you can hear me, there are many, many of us in whose hearts you will live forever, regardless of whether they ever find you and wherever you're finally properly laid to rest. For the last 64 years your spirit has been everywhere, and that's exactly where it will remain. I hope that if you are found, they treat you right this time around.